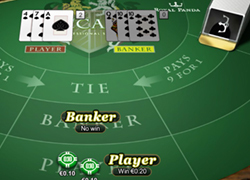 Baccarat, or punto banco, is a casino table game that can also be played online. Predict which hand will win, and you’ll win as well! At Royal Panda you can play baccarat for money or for free. You start betting from as little as $0.10, and you could win up to eight time your wager. If you register with Royal Panda, you’ll receive a 100% welcome bonus up to ₹7500! Up to 8x your wager! You can place three different bets in baccarat: on the bank, on yourself, or on a draw. Each wager gives you a different payout. If you predict a draw, you’ll win back 8x your wager! Predict whose hand will be closest to nine points: will it be the bank’s or your own, or will it be a draw? Read our baccarat guide and discover more this great casino game. To improve your chances of winning, you could use baccarat strategy. This way you won’t be gambling, so much as following a predetermined pattern. By playing baccarat for free, you can develop a good understanding of the game before you start playing for money. That way, you won’t lose money and can try out different strategies. You can also play live baccarat. This means the dealer is a real person. You’ll see the dealer on your screen as you play baccarat with them. You’ll feel like you’re playing in a real casino. Baccarat is an age-old casino game. It is likely that the game was first introduced to France via Italy between 1483 and 1498. The game has three variants: baccarat chemin de fer, baccarat banquet, and punto banco. The latter became popular mainly because this variant is played in casinos. 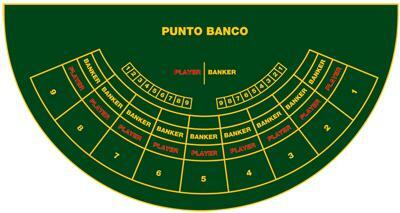 If you play baccarat online, you’ll mostly be playing the punto banco version. The game rules are the same and there is only a small difference. The cards are always dealt open in punto banco, but this isn’t always the case with offline baccarat. Betting on a tie? Then the house’s advantage is 15.75%. The high house advantage of a tie means it’s never advisable to bet on a tie.